The images we receive on our TV form the TV Aerial or Satellite in Manchester is send by a signal relayed from space radio stations ( e.g DVB satellite or DVB-T ) . These signals are then received via our outdoor parabolic (dish) or Aerial. For the DVB satellite systems, the signal received by the dish from transmitter or space radio station is then reflected to a LNB. The satellite receiver then decodes the desired television programme for viewing on a television according to the Satellite at which the dish or parable is pointing. In some cases the satellite or TV Aerial signal is not balance enough to be accepted by our television or satellite receiver tuner, this is when our company act. 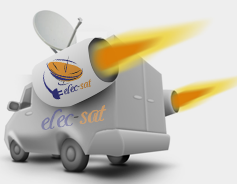 Elec-sat installation is a satellite and TV aerial installation company based in Manchester and we do cover all the Greater Manchester. If you are or just moved to Manchester and need a TV Aerial , Satellite dish and Motorised dish system to be installed in your property please don’t hesitate to contact elec-sat installation, we would be more than happy to provide a free estimate and send a engineer for an assessment at your convenience . Airport M1 M2 M3 M4 M5 M6 M7 M8 M9 M11 M12 M13 M14 M15 M16 M17 M18 M19 M20 M21 M22 M23 M24 M25 M26 M27 M28 M29 M30 M31 M32 M33 M34 M35 M38 M40 M41 M43 M44 M46 M50 M60 M90.We have satellite TV engineers working in Stockport every day, and you may well have seen our Van in your location.